Announcing the launch of our new school app! As part of our commitment to communicate with parents and carers, we are delighted to announce the launch of our new school app – mySchoolApp. Instant access to an up-to-date school calendar. You can add any event to your own calendar on your phone, with just one tap on the screen. Keep up-to-date with what is happening at the school. Read bite-sized news items and newsletters or swipe through the school image gallery. The first step is to get mySchoolApp on your phone or tablet. The easiest way, is to use your device to search on the App Store (Apple) or Google Play (Android) for mySchoolApp. Please make sure you type it in as all one word when you search. It’s the one with the multicoloured stickboy app tile shown on the first page of this letter in the top right hand corner. Once you have mySchoolApp on your device there are just a few things you need to do, to ensure you get the most from the app. On the initial screen, start to enter the school name. When you have entered a few letters, the app will give you some suggestions. Tap on the correct school name and you will be redirected in to a logged in page. 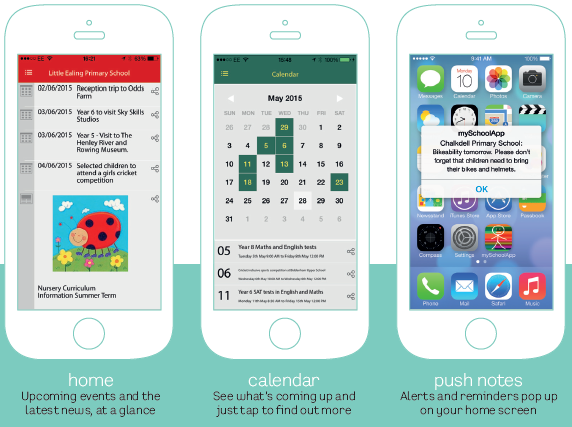 You only have to do this once, mySchoolApp will remember your school automatically in future so that when you tap on the App from your home screen, it will go directly to the Chatsworth home page. Once you have selected Chatsworth as your school, you will be required to enter your details. This is a once only form and enables the app to identify you to the school. The school app administrator will be able to see your name, email and phone number. We also request you create a PIN, which is private. This will be used if you submit an absence notification via the app, ensuring only you can use this feature. Please make sure you select a 4-digit pin number that you will be able to remember. Please also make sure that you do not share this pin number with your child. Push notifications enable the school to notify you of new messages or events without the need for you to open the app. We would highly recommended that you choose to accept push notifications from mySchoolApp, to ensure that you receive important or urgent communications, such as a school closure due to snow or a club being cancelled. We have allocated class notification groups which you will be able to see in ‘Settings’. Simply opt in to whichever groups apply to you. This will ensure that you receive notifications from the relevant group(s) you selected only. select the language you would prefer to read app content – there are a number of different languages you can chose from if you would prefer to use the app in a language other than English. We hope you find our new app useful. If you have any questions, please do not hesitate to call or pop into the school office.